Brownells began as David Moses' London Mart, a drapery and general store, built in 1836 when Liverpool Street was a dirt road which became a quagmire in winter. The shop became Brownell Brothers in 1888, and a public company in 1902. It offered a successful mail-order service from inception, and in 1912, it introduced a unique and free service for remote female customers: Brownell's Famous Lady Shopper, known as Aunt Edna. Naturally most of the shopping was done in-house, but Aunt Edna also undertook other commissions and purchased outside goods, which she dispatched with one of her much-prized 'homely, womanly, and sympathetic' letters. 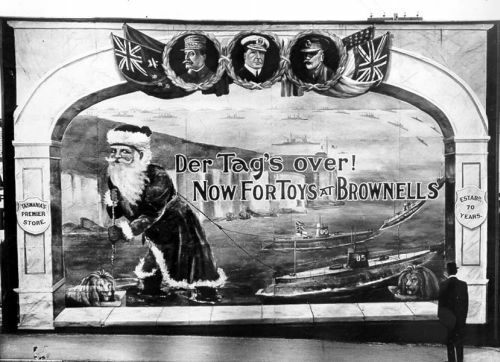 Remodelled in the 1950s using the latest American techniques, Brownells became Tasmania's largest departmental store. It was taken over by Myer in 1959. Further reading: Brownells Limited, Centenary Supplement, Hobart, 1936; Brownells Limited, The interesting story of Aunt Edna, Hobart, 1922; L Scripps, Central Hobart, Hobart, 1991.